The last few days have been very hot and sunny in Paris. I feel more energetic and happier when the sun shines. Plus, we all know that sunshine boosts levels of serotonin the body's natural happy hormone. Hopefully the weather will stay that way so that we can enjoy these beautiful days full of sunshine. Summer is right around the corner and you know what that means. Are you getting ready for your summer holidays? Now is the best time to shop for new bikini. But finding the right swimwear isn't always easy. They come in so many different styles. If you are going away and you are looking for a nice beach costume, take a look at Zaful and their new collection of swimwear. Whenever I go on holidays, I'd like to have with me 3-4 pairs of swimming costume. When you own attractive bikini that fit you properly and flatter your body, you'll instantly boost your self-esteem. 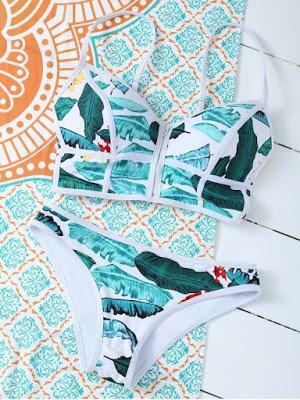 Take a look at my swimwear wishlist and get inspired. Pamper yourself with some lovely bikini. a.) A string bikini set featuring a colorful stripe sailor-inspired design, a triangle halter top with padding and self-tie collar and back closures, as well as a matching pair of bikini bottoms with self-tie sides. b.) A cute pink frilly bathing suit featuring striped wrap tie bikini top and side tie swim bottoms, padded.